Food Drive at Great Western Bank! 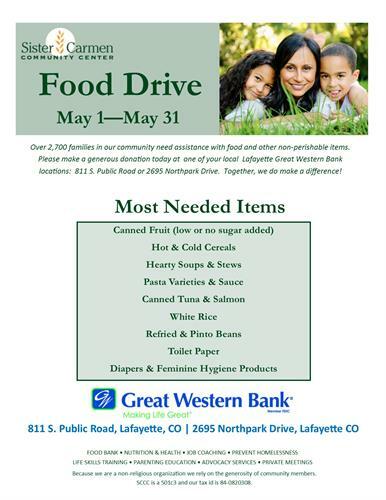 Great Western Bank is hosting a Food Drive benefiting Sister Carmen Community Center! Sister Carmen serves over 2700 families in our community who are in need of assistance with food and other services. Please make a generous donation today at Great Western Bank, 811 South Public Road or 2695 Northpark Drive. Together we will make a difference!